Test Drive Your Way to Free Money V2. Subaru is paying you to visit their dealerships and test drive a brand new Subaru for a $50 prepaid visa gift card (offer expires 03/31/2016)! No purchase necessary of course. Wouldn't be slick if you had to drop $25k for a $50 gift card.. There's a couple of locations in the Greater Houston area partaking in this deal for us to visit. The Southwest location is perfect for my Asian brethren. Test driving cars and tapioca go well together, and are perfect for a date night. 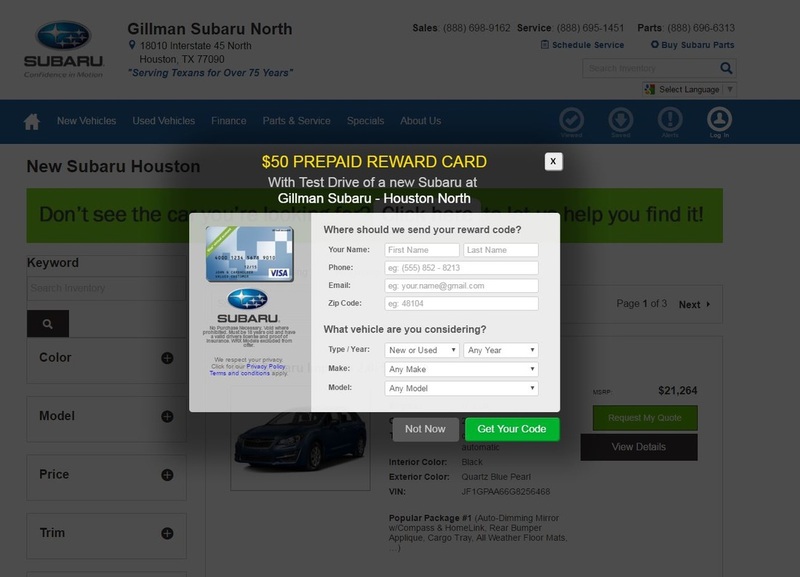 Follow the links below to visit the nearest Subaru dealer to you in Houston. For those of you who might actually live in Bel Air or Philly or wherever. Use this link to find your nearest Subaru dealer. http://www.subaru.com/find-retailer/index.html I already looked in nearby Austin and Dallas, and there's a few more dealerships with this same deal! After you click the link this screen shot below will pop up and you'll have to fill out your information, then print out the form. Then take the form to the dealership, present it to a sales associate and he'll walk you through the steps from there. Usually, you will have to actually go on a test drive. But for me, I went to the Spring location and was in/out of the dealership in 4 minutes, literally. I spoke to the associate and asked what I needed to do, and all he needed was my form and said I would get an email with my gift card in a few minutes. He shook my hand and I left! $50 for 4 minutes is amazing work. If you're at the dealership and they give you any trouble, just remember to say "gimme da loot, gimme da loot"! ​And of course, can't stress this enough, DO NOT, PLEASE DO NOT forget to grab a free water bottle on the way out. Can't leave the dealership thirsty after doing all that work, work, work.